Since the Second World War ended, America has performed like a gyroscope losing its balance, wobbling this way and that, unable to settle into itself and its own great promise. Wendell Berry has been a voice for that promise, a voice for reason and hope and urgent concern. As the United States prepares to leave its long war in Afghanistan, it now must contemplate the necessity of sending troops back to Iraq, recalling General Colin Powell’s advice to President Bush: “If you break it, you own it,” as the world’s hot spots threaten to spread over the globe with the ferocity of a war of holy terror and desperation. The planet’s environmental problems respect no national boundaries. From soil erosion and population displacement to climate change and failed energy policies, American governing classes are paid by corporations to pretend that debate is the only democratic necessity and that solutions are capable of withstanding endless delay. Late Capitalism goes about its business of finishing off the planet, and we citizens are left with a shell of what was once proudly described as The American Dream. In this new collection of ten essays, Berry confronts head-on the necessity of clear thinking and direct action. Never one to ignore the present challenge, he understands that only clearly stated questions support the understanding their answers require. For more than fifty years we’ve had no better spokesman and no more eloquent advocate for the planet, for our families, and for the future of our children and ourselves. 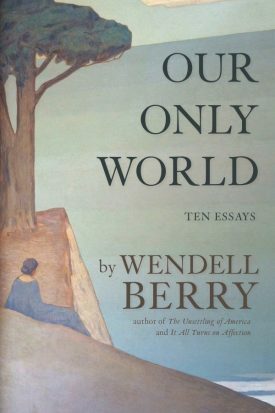 WENDELL BERRY is an essaying, novelist, and poet, and has written more than thirty books. He lives and works in his native Kentucky with his wife, Tanya Berry, and their children and grandchildren.